Rustyback is not easily confused with other wild plants on this web site. A frequently occuring native, Rustyback is well-named for the brown, scaly covering on the underside of its distinctive leaves. These pinnate leaves (3-12 cm long) are in dense tufts, quite a dull shade of green above with the rust-coloured sori below, the spores ripening from April to October. 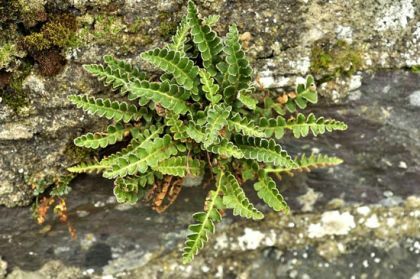 Found in crevices of limestone rocks and old walls, it can survive dry spells, reviving when rehydrated by rain. Formerly known as Ceterach officinarum, this evergreen fern belongs to the Aspleniaceae family. 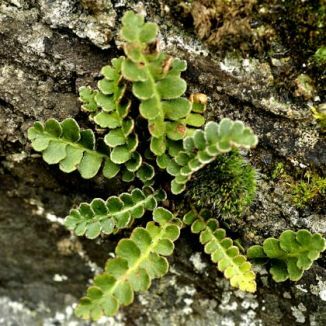 I first recorded this little fern in the Burren, Co Clare in 1995 and photographed it in Roundwood, Co Wicklow in 2010.